Large evergreen shrub with leathery, matte dark green leaves. 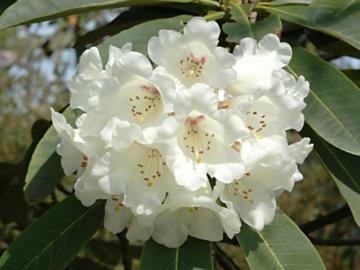 Very large rounded trusses of creamy white flowers with red markings in the throats, in mid spring. Hybrid of Rh. 'Avalanche' x Rh. lacteum. Rothschild hybrid, raised at Exbury.